We have covered the Anglo-Saxons all the way up to Edward the Confessor so it was only natural that we moved onto the Battle of Hastings. And it just so happens we were given a Battle of Hastings pack by Oaka Books so we dived right in. The topic pack came with a Topic Booklet, Write your own Booklet and a Revision map. We started with the Topic Booklet. My daughter and I read through it together and I must admit I thought it was really well set out. I liked that the booklet started with a mind map of all the events. Then it explains why the Battle of Hastings actually occurred – that Edward the Confessor died and there were 3 claimants to the throne. It goes onto setting the scene for the events that followed. Onto the first invasion and battle at Stamford Bridge followed by William’s invasion and subsequent battle. My daughter commented on how she found the pictures really helpful for remembering the events – the images of Hardrada dead, of Harold refusing to listen to his brother’s advice to rest his troops and of Harold with an arrow in his eye, were very effective. The images are in no way scary, they have a cartoon feel about them but they were effective and key in helping my daughter remember the order of events very quickly. The Topic Pack ends with a 2 page summary of why King Harold lost and Why William won – a really good wrap up. After going through the Topic Booklet she wanted to give the Revision Map a go. We have never tried one of the History topic revision maps before and I think they are genius, very simple but so effective (and I don’t mean simple in a critical way I mean that as a compliment, we are not fans of pages that are crammed full of distracting images that overwhelm the kids). As the kids work through the revision map they add the character cards that come with it to the map (they also give you plastic stands as seen in the photos below). My daughter also thought the character cards were a useful tool on their owns – she has since used the character cards to retell the entire story of the Battle of Hastings. My daughter LOVES these revision maps and has very excitedly informed me that a similar one is included in the Spanish Armada Topic Pack and I had a quick look on the website and it looks like the Battle of Waterloo Topic pack also has a revision map activity. My daughter and I recommend this Topic Pack !! Admin Bit – We went sent a parcel of goodies from Oaka Books earlier in the year. It was up to us what we used / how we used it / when we used it and what we thought of it. One of the reasons I was happy to get the parcel in the first place was because we have already used 2 of their Key Stage 2 Topic Packs and played one of their games before and I liked the style so I was expecting more of the same. 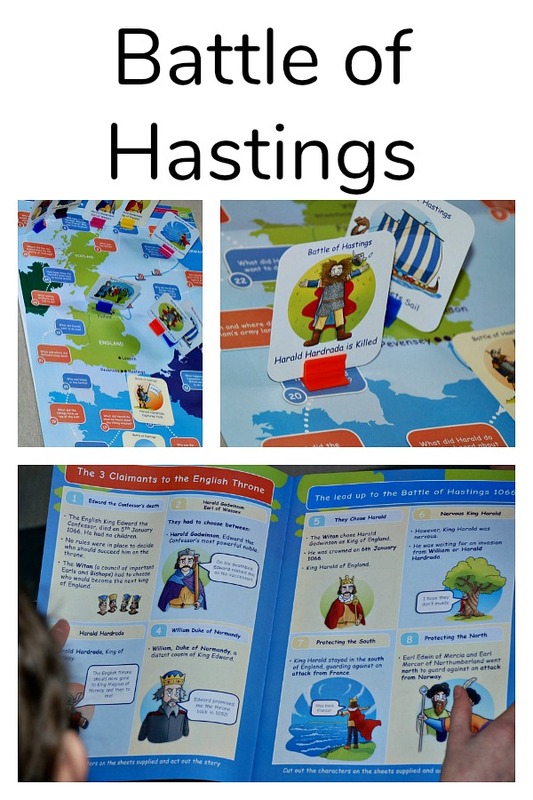 This entry was posted in History, Homeschooling and tagged Battle of Hastings, British History, History, home ed, home education, homeschooling, KS3, Oaka Books. Bookmark the permalink.